•Urban Shield is a continuous, 48-hour Full Scale Multi-Disciplinary Homeland Security/Disaster Preparedness Exercise hosted by the Alameda County Sheriff’s Office, with the support of the Bay Area Urban Area Security Initiative (UASI), and more than 150 local, state, federal, international and private sector partners. •First responders are presented with exercise scenarios that incorporate key elements of real-world emergencies and major critical incidents at various scenario sites in Alameda, San Francisco, San Mateo and Santa Clara counties. •An Incident Command System (ICS) structure—with ten Area Commands, Medical Checkpoints, and a Department Operations Center (DOC)—will be implemented to manage the multi-location and multi-discipline full-scale exercise for Urban Shield 2013. 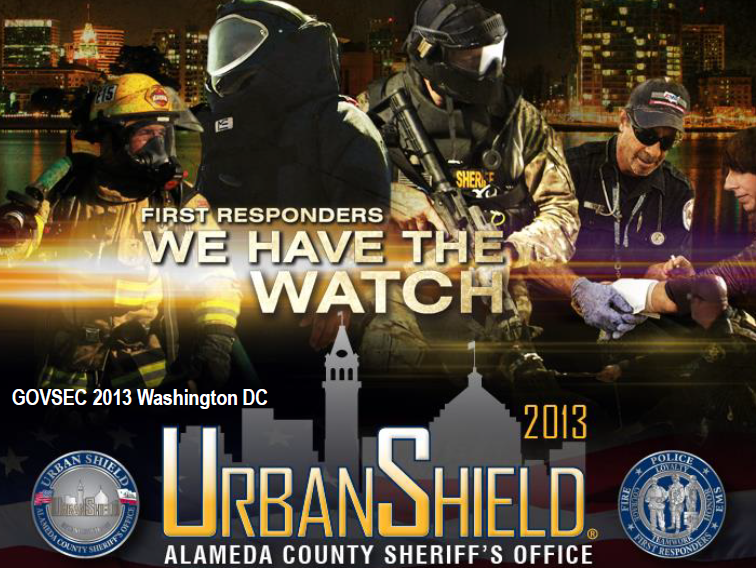 •The overarching goals of Urban Shield are to provide a multi-layered training exercise to enhance the skills and abilities of regional first responders, as well as those responsible for coordinating and managing large scale events. This exercise is designed to identify and stretch regional resources to their limits, test core capabilities, while expanding regional collaboration and building positive relationships. In addition, this exercise provides increased local business and critical infrastructure collaboration. •Urban Shield 2013 will operate under the principals of the National Incident Management System (NIMS), Standardized Emergency Management System (SEMS) and the Incident Command System (ICS) structure. Regional emergency management personnel will control the exercise utilizing the Emergency Operation Centers and mobile command posts throughout the region. Alameda County OHSES will serve as the Department Operations Center (DOC).